Already well-known for his fine dining prowess, Chef Eric Greenspan created his first menu for The Foundry on Melrose to make his deliciousness accessible to everyone. 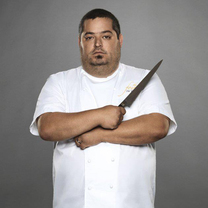 He is the owner of Greenspan's Grilled Cheese, The Roof On Wilshire, Erven, and Fleishik's. "Not only is the skin crispy, but so are the bones. However, the meat is somehow still so moist—it defies science. Throw in pickled radish and mystery garlic sauce, and you're begging for one of their yellow shirts to display your allegiance." "This is the closest thing to New York-style pizza that I've found in LA. The crispy crust with its hint of sweetness is the perfect delivery device for the creamy and crunchy toppings. I always make my own with eggplant, ricotta and sausage." "This sandwich is the biggest culprit in my battle with weight gain, and no one makes it better than at Café Orleans in Disneyland. I know what you're saying, but trust me—it's fried, crispy and served with a sweet and tangy jam. Perfect." "I've been going here for years and finally cracked the code. It's everything good comfort Mexican food should be in one little package: spicy, cheesy, and filling. Not to mention the late-night people-watching, which is always fun." "This tofu is silky-smooth in texture and lightly sweet with the ginger syrup. It's the most delicate of dishes. I love the build-up of anticipation, because you never know when that cart is coming!" "The lines are out the door for a reason. You cannot help but overeat here—all the dumplings explode with hot, juicy soup when you bite into them." "How we do crispy kreplach @#geshmak"